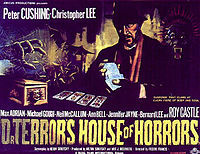 Dr. Terror's House of Horrors is a portmanteau film consisting of five stories within a frame story. Five men enter a train carriage in London bound for Bradley, and are joined by a sixth, the mysterious Doctor Schreck (Peter Cushing wearing a beard and false eyebrows). Schreck is the German word for terror, hence the title of the film. It also recalls Max Schreck, the actor who played the title role in the 1922 vampire classic Nosferatu. During the journey, the doctor opens his pack of Tarot cards and proceeds to reveal the destinies of each of the travellers. This provides the framework to tell five horror stories. The first story concerns an architect, Jim Dawson (Neil McCallum), who travels to a Scottish island to alter the house of Mrs. Biddulph (Ursula Howells). By coincidence, this house was previously owned by Dawson's ancestors. Venturing down into the cellar, he finds a fake wall behind which is the coffin of Count Valdemar. Valdemar had sworn a curse against the descendants of the Dawson clan and vowed to reclaim the house that was stolen from him. The coffin has sculptures of the heads of wolves on it, and soon Dawson realises that lycanthropy is involved. The second story has Bill Rogers (Alan Freeman) and his family returning from vacation to discover a fast-growing vine has installed itself in the garden. When the plant seems to respond violently to attempts to cut it down, Rogers goes to the Ministry of Defence, where he gets advice from a couple of scientists (played by Bernard Lee and Jeremy Kemp). It soon turns out that the plant has become intelligent, and harbours homicidal tendencies towards any threats to its existence. Story three is the intentionally humorous one. Biff Bailey (Roy Castle) is a jazz musician who accepts a gig in the West Indies, and foolishly steals a tune from a local voodoo ceremony. When he tries to use the tune as a melody in a jazz composition back in London, there are dire consequences, mainly for the viewer. Castle was a last-minute replacement for Acker Bilk, who had suffered a heart attack. Castle's band was played by the Tubby Hayes Quartet, a leading British modern jazz group of the time. Castle, when appearing to play with the band on-screen, actually mimes the trumpet part to the soundtrack recording of trumpeter Shake Keane. Next is the tale of Franklyn Marsh (Christopher Lee), an art critic who seems more concerned with his own devastating wit than art itself. Painter Eric Landor (Michael Gough) bears the brunt of one of Marsh's tirades, but gets even by humiliating the critic publicly. When Landor takes it too far, Marsh responds in violent fashion causing Landor to lose one of his hands. Unable to paint any more, Landor commits suicide. Marsh is then tormented by the disembodied hand, which seems immune to fire as well as possessing the skills of Harry Houdini. Lastly, Dr. Bob Carroll (Donald Sutherland) returns to his home in the United States with his new French bride Nicolle (Jennifer Jayne). Soon there is evidence that a vampire is on the loose, and Carroll seeks the aid of his colleague Dr. Blake (Max Adrian), only to find out that his bride is the vampire. Following Blake's advice, Carroll kills Nicolle. But when the police come to arrest Carroll under the charge of his wife's murder, Blake denies giving any such advice. When the police takes away Carroll, Blake says that there is not enough place in the city for two doctors or two vampires, and himself turns into a bat. The frame story ends with a twist: From the Tarot cards, the doctor informs the men that the only way they can avoid these horrible destinies is by dying first. When the train stops, the men find out that they are in some kind of limbo, having already perished in a train wreck.